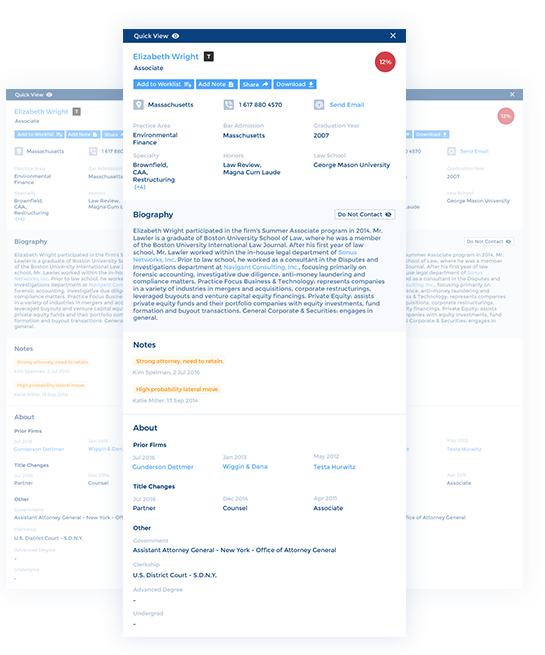 A comprehensive platform built to deliver targeted candidate, law firm and job searches as well as unparalleled market intelligence. Firm Prospects allows for lightning fast and precisely targeted candidate, law firm and job searches. Our analytics and candidate data can help your law firm with both hiring and retention. Sophisticated law firm and market analytics provide an unparalled look at the legal marketplace. The entire Firm Prospects platform is built upon a comprehensive and accurately categorized database resulting in targeted search results and precise analytics. 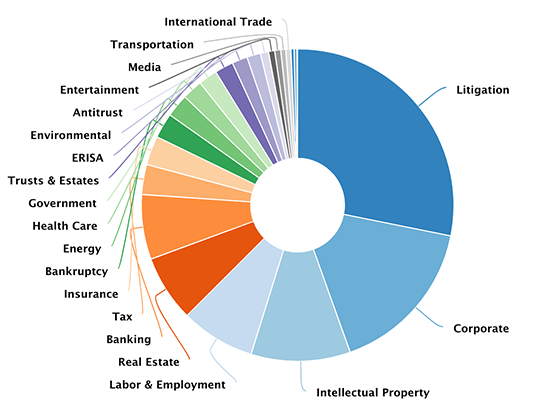 Our data is categorized by former employees of top law firms - professionals who understand nuanced areas of law from antitrust to zoning. We also employ a proprietary artificial intelligence ("AI") system that has "learned" how to categorize data based on the work done by the above mentioned attorneys. This combination allows us to keep costs low while still having the highest quality data. 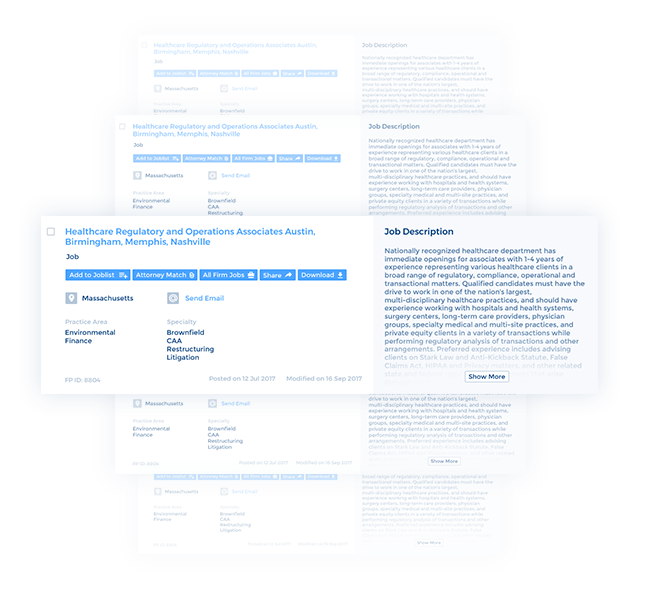 With over 200,000 relevant candidates, each of which has been accurately categorized into practice area and specialty, our customers can instantly target the most qualified attorneys. Recruiters can search for firms based on a number of different criteria to find the firm that are the best fit for their MPCs. Our jobs database is packed with job listings from national and international law firms. We provide real time job updates via e-mail alerts throughout the business day. Finding the right candidate and retaining that individual is one of the most time consuming and costly challenges businesses face. Law firms are no exception. Firm Prospects' analytics can also look prospectively. With the assistance of a proprietary predictive analytics algorithm, our data can help customers identify those associate attorneys more likely to make a lateral move and, when deemed appropriate, take early action to retain them. Our platform allows for seamless interaction with your preferred legal search firms. In depth reporting and analytics can help you to target new candidates as well as retain your current attorneys. Identify associate attorneys more likely to make a lateral move within 6 to 12 months. Firm Prospects offers detailed analytics about individual law firms as well as various trends in the lateral hiring market. Most importantly, Firm Prospects' analytics helps our customers understand and leverage historical lateral hiring data, including what firms and practice areas are expanding or contracting, where those attorneys are moving, and why. 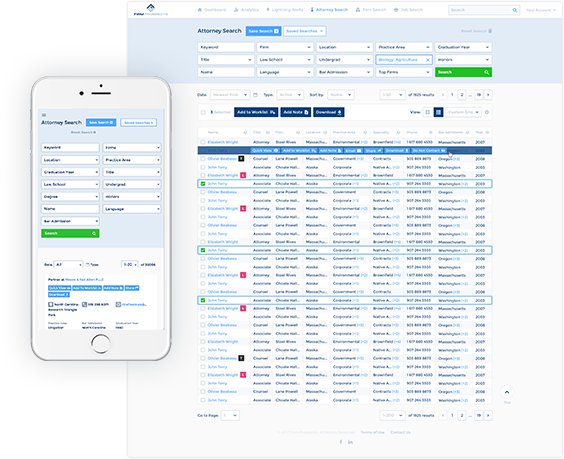 Instantly compare multiple law firms side-by-side based on over 20 data points. Research lateral movements in any market and "drill-down" using multiple filters. Track a number of different hiring trends based on location, practice area, title and other criteria.